This entry was posted in New designs, New posters, News & Events and tagged Abby Mueller, Alan Jackson, Andy Jackson, Brad Paisley, Carly Rae Jepson, Carole King, Charli XCX, Chillina Kennedy, Fall out Boy, Fifth Harmony, Flo Rida, Imagine Dragons, James Taylor, Janelle Monae, Jason Aldean, Jennifer Lopez, Keith Urban, Little Mix, Lunchmoney Lewis, Maddie and Tae, Meghan Trainor, Nate Ruess, nyc, Pitbull, Rob Thomas, Rockefeller Plaza, Shaggy, strawberryluna, The Today Show, TODAY, Today Show Concerts, Today Show Plaza, Today Show Posters, Today Show VIP passes, Toyota Summer Concert Series, Wondaland by allison. Bookmark the permalink. This is just so cool! These designs are incredible! I am really so excited for you guys. This was such fun news to read. What great news! The work is incredible; both consistent, relevant, and completely creative, respecting the artists in inventive ways. Congratulations! I’m happy for you but not terribly surprised, as you are incredibly talented. Are these posters for sale anyplace? Thanks for any info. 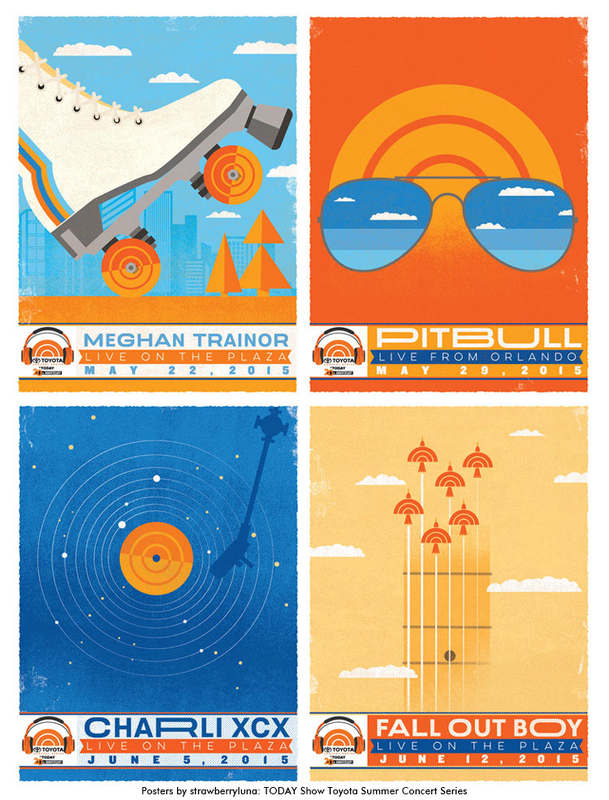 Great designs on all the posters. Hello and thank you Ron! These posters won’t be available like many of our others. They are being given away at the individual performances to the fans on the day of the each act’s show. I noticed your posters in the Orange Room on the Today show, they are wonderful! Do you sell these as prints? Thank you so much Erin! 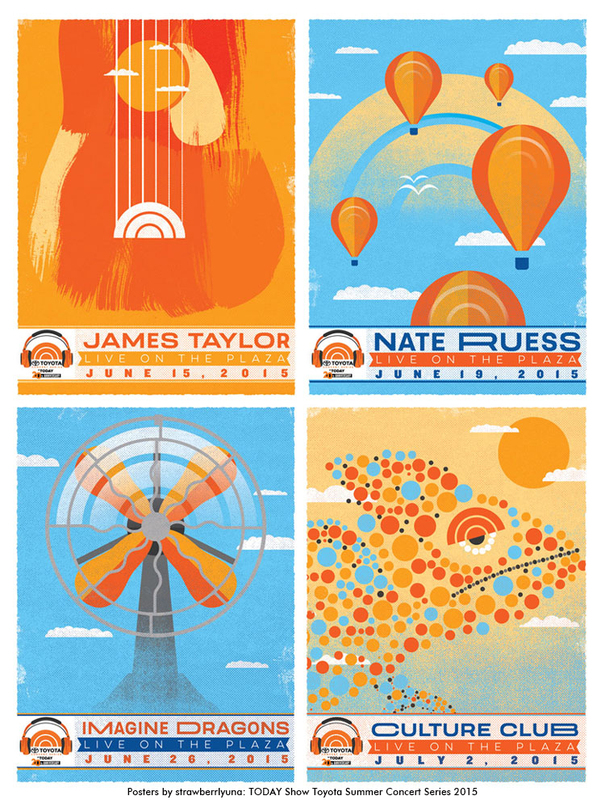 We do not sell any of the posters that we created for The Today Show, they fully own the designs that were chosen for each band and gave them out at each concert to the fans and used them for promo.